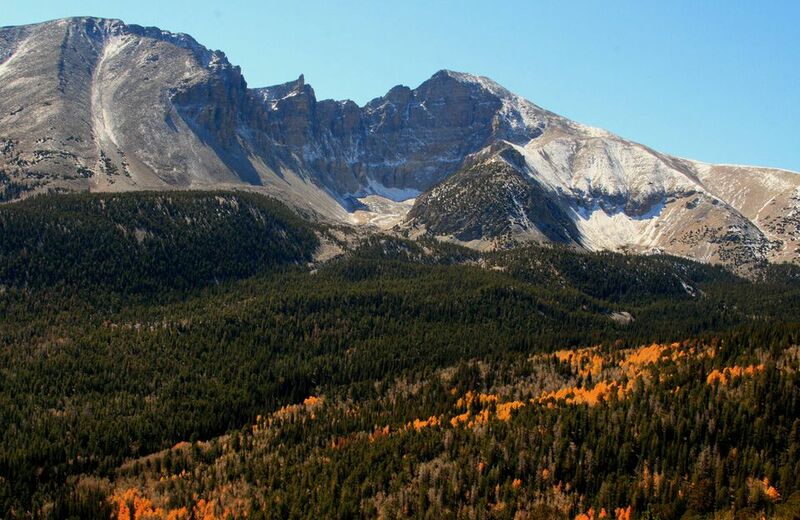 If you love the outdoors, Great Basin National Park is the park for you! Whether you are looking to camp, hike, or enjoy a night under the stars, this Nevada park has something for everyone. This Ice-Age landscape is full of glacier-carved peaks and extends east from California’s Sierra Nevada to Utah’s Wasatch Range, and from southern Oregon to southern Nevada. While its name suggests it may be one large basin, Great Basin National Park is actually made up of at least 90 basins and rivers that flow inland - not to any ocean. The name was given by explorer John C. Fremont in the mid-1800s. President Warren G. Harding created Lehman Caves National Monument by presidential proclamation on January 24, 1922. It was incorporated into the National Park on October 27, 1986. The park is open year-round, though the upper eight miles of Wheeler Peak Scenic Drive are closed November to May. Summer is the most popular time to visit as temperatures are usually mild. If you are looking for cooler temperatures and fewer crowds, plan a visit during September or October. For those flying into Nevada, the nearest airport is located in Ely, 70 miles away outside of the park, and Cedar City, UT, 142 miles away. Major airports are also located in Salt Lake City, UT (234 miles) and Las Vegas, NV (286 miles). From the east or west: From U.S. Highway 6 & 50, turn south on Nevada State Highway 487 and travel 5 miles to Baker, NV. In Baker turn west on Highway 488 and travel 5 miles to the park. From the south (Utah): Travel north on Utah State Highway 21 through Milford, UT and Garrison, UT, which will become Nevada State Highway 487 as you cross the border. Turn west on Highway 488 in Baker and travel 5 miles to the park. From the south (Nevada): Travel north on U.S. Highway 93 (Great Basin Highway). At the junction of U.S. Highway 6 & 50 drive east to Nevada State Highway 487 and turn south. Travel 5 miles to Baker, NV. In Baker turn west on Highway 488 and travel 5 miles to the park. There is no entrance fee for Great Basin National Park. But, if you purchase an America the Beautiful Annual Pass at the park, you will receive one free cave tour. Visitors interested in the Lehman Caves Tours will be expected to pay a fee. Annual passes, such as the America the Beautiful Pass, do not cover cave tour fees. Holders of Golden Age and Golden Access cards are eligible for discounts. The park offers programs geared towards the younger visitor and their families on summer weekends (Friday through Sunday) at 11 a.m. and 3 p.m. at the Lehman Caves Visitor Center. Check at either visitor center for topics and up-to-date information. Lunch at the Bristlecones: Pack a lunch and meet a park ranger at the Bristlecone Grove along the Bristlecone Trail for a talk about these amazing trees. This is offered daily in the summer months at 12 p.m.
Evening Campfire Programs: Campfire programs are offered Memorial Day through Labor Day at Upper Lehman Creek Campground and late June to Labor Day at Wheeler Peak Campground. Topics vary and the program runs 40-60 minutes. Be sure to bring warm clothing and a lantern or flashlight. Astronomy Programs: Join a park ranger for an evening under the beautiful stars during the summer months. Lehman Caves: Guided cave tours began back in 1885 and continue today to showcase the majestic underground limestone cave. Check out stunning stalactites and stalagmites in the Gotham Palace, and rimstone pools and soda straws in the Lake Room. Wheeler Peak: This scenic drive could take up most of your day. Be sure to pull off for short trails to check out historic sites like Osceola Ditch - built in the 1880s for mining. Bristlecone Forest Loop: This trail takes visitors through a forest of ancient trees and twisted trunks. Camping is a great way to stay at the park and visitors can choose to stay in the backcountry or at a campground. If you choose to explore the backcountry, be sure to stop at the Visitor Center for a free permit. There are four campgrounds within the park, all with 14-day limits and offered on a first-come, first-served basis. Baker Creek and Upper Lehman Creek open mid -May through October. Wheeler Park open mid-June through September and Lower Lehman Creek is open all year. There are no lodges within the park but there are plenty of hotels, motels, and inns located in Baker and Ely, NV. For a complete list of accommodations, call the White Pine Chamber of Commerce at (7775) 289-8877.